This fresh tomato sauce has both depth of flavour and sweetness, minus sugar or sweetener. It is easy to make and mix in with your choice of whole wheat pasta and vegetables! I love pasta, especially spaghetti with tangy tomato sauce. Eating tomato-y spaghetti at Spaghetti Kitchen in Hong Kong is one of my favourite food memories from a long, long time ago! For this simple tomato sauce, I used fresh, ripe, round tomatoes (not the hard, oval, salad kind). For the sweetness I used… drum roll, please…..cherry tomatoes! Yup, this batch of cherry tomatoes was sweet and tangy so I got that lovely mix of flavours in the sauce. Easy, right? For depth of flavour I blended the sauce flavouring ingredients (garlic and oregano) right into the cooked tomatoes. That’s it! I’ve used soya flakes in this recipe for the protein element but you could use mushrooms instead. (My spouse is mistrustful of mushrooms. Sigh!) Soya flakes are slightly bigger than granules and slightly smaller than nuggets – just the right size for this spaghetti! 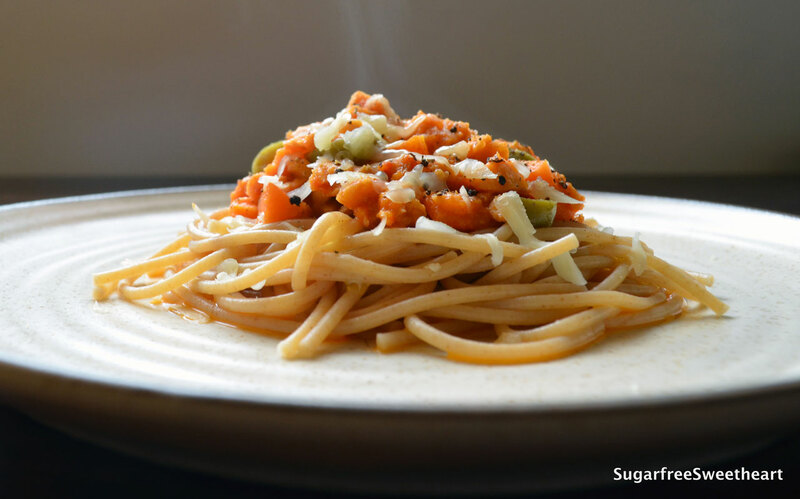 This recipe is suitable for diabetics, weight watchers, and lovers of slurpy spaghetti! You could add salt while cooking your spaghetti: it tends to take longer to cook but the wholewheat spaghetti has a better chance to soak up the salt. Use the widest bottomed pan you have for cooking the sauce so that the tomatoes cook down quickly and evenly. Add some pasta water (saved from draining the cooked spaghetti) if you want to loosen your sauce but do so only right before serving or it’ll get absorbed by the soya flakes! 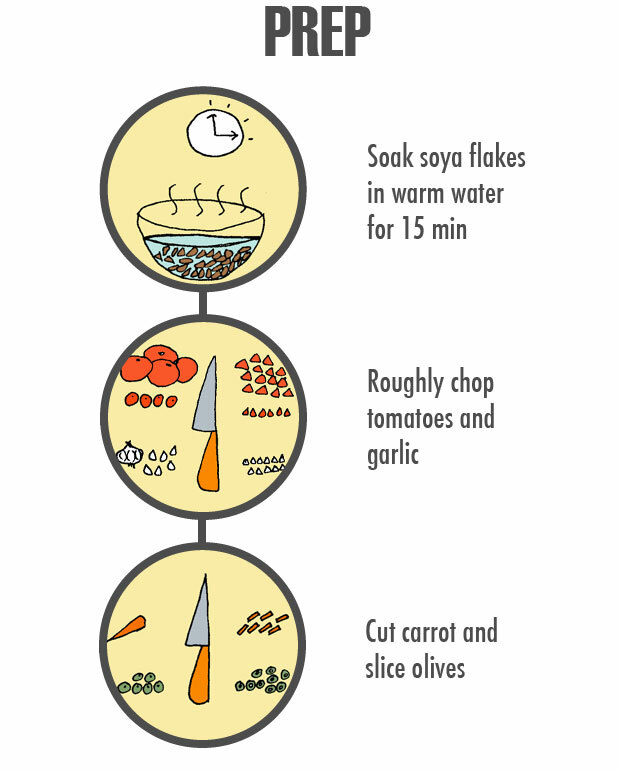 Substitute soya flakes, carrots, and olives with vegetables of your choice. You could combine any of zucchini, broccoli, bell peppers, and mushrooms. Add onions to the sauce before blending if you’d like a warmer, more Indian tasting sauce. I love spaghetti too! and marinara to coat is like having a rich cream topped cake 😉 yumm yumm yumm! Lip smacking, right? Thanks, Namrata!